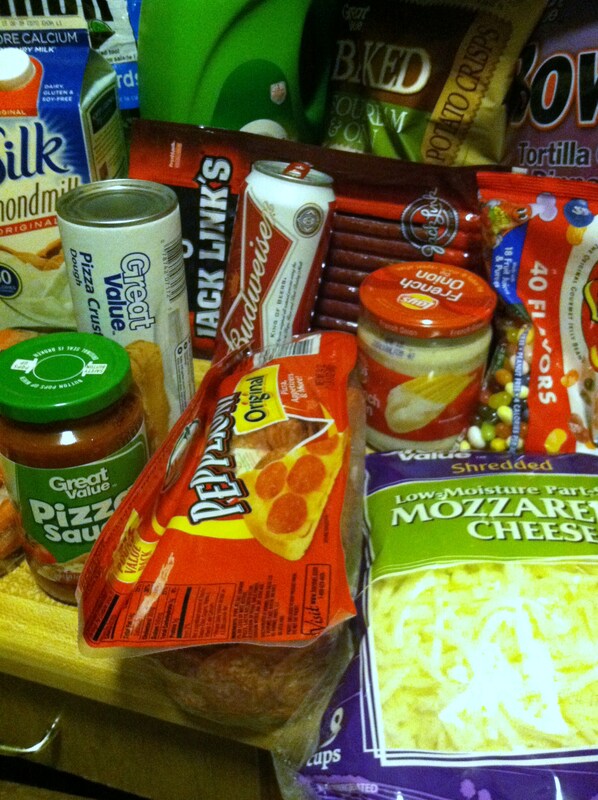 Okay, thanks for hanging in there readers, on to the deets of this week’s noms! 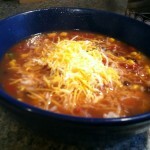 I had made a big ol’ pot of crockpot chili on Sunday night, which is one of my favorite things to do. 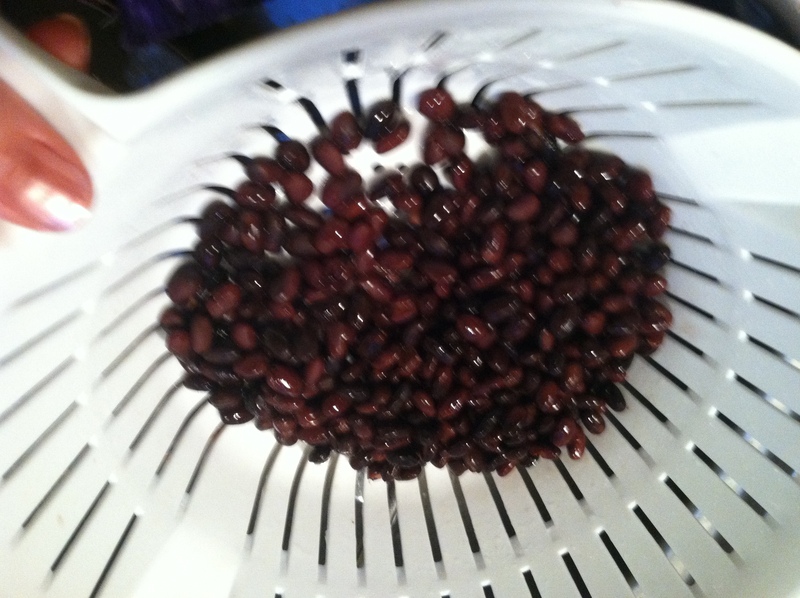 I take all the kinds of dried beans in the house, and soak them in water overnight. 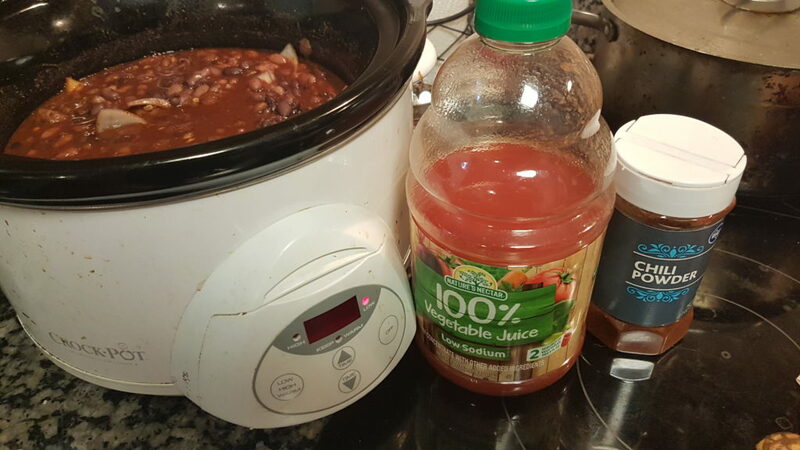 In the morning, I pour out the water, refill it, and add the extra tomato juice, veggies, meat, and spices. Then you just let it rock and roll all day. 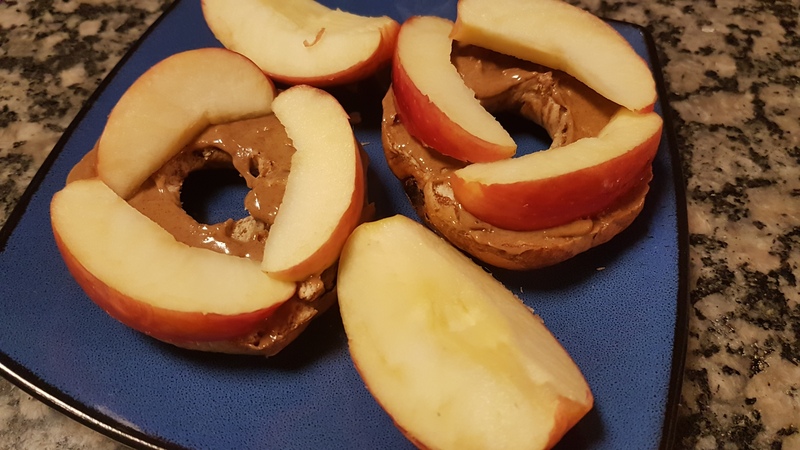 Breakfast – bagel with almond butter & apple. 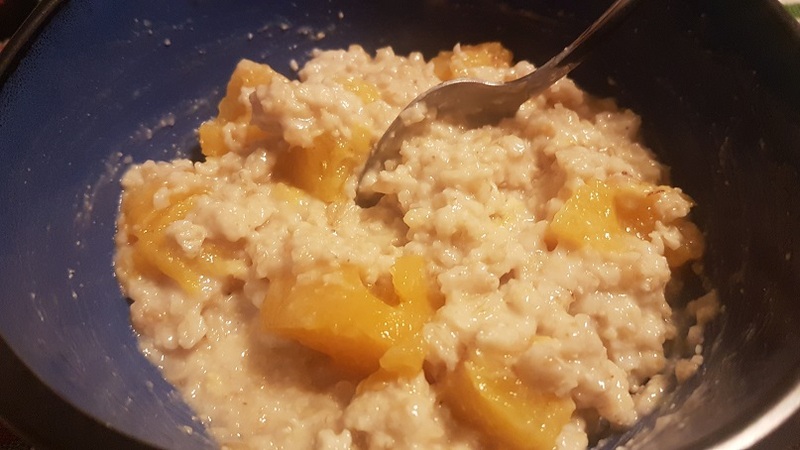 This has become one of my favorite to-go breakfasts, so fast and easy, yet healthy! 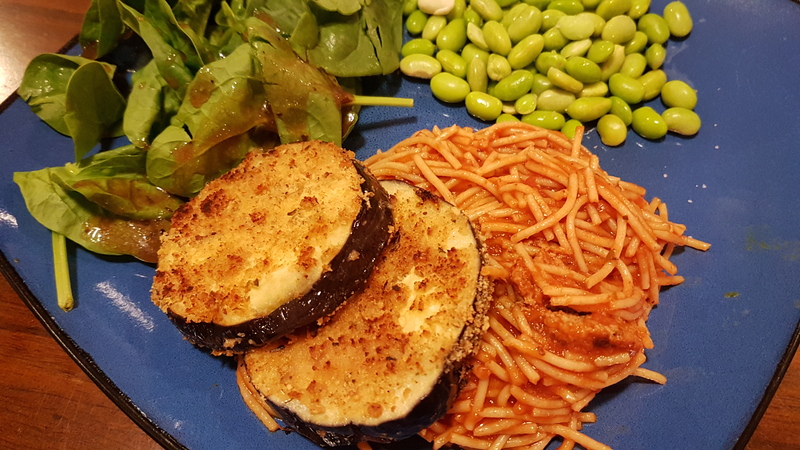 Dinner – eggplant parm & pasta. I have tried multiple times, I just cannot like eggplant! This saddens me, because it is so good for you, and people very often want to give it away. But I just cannot. 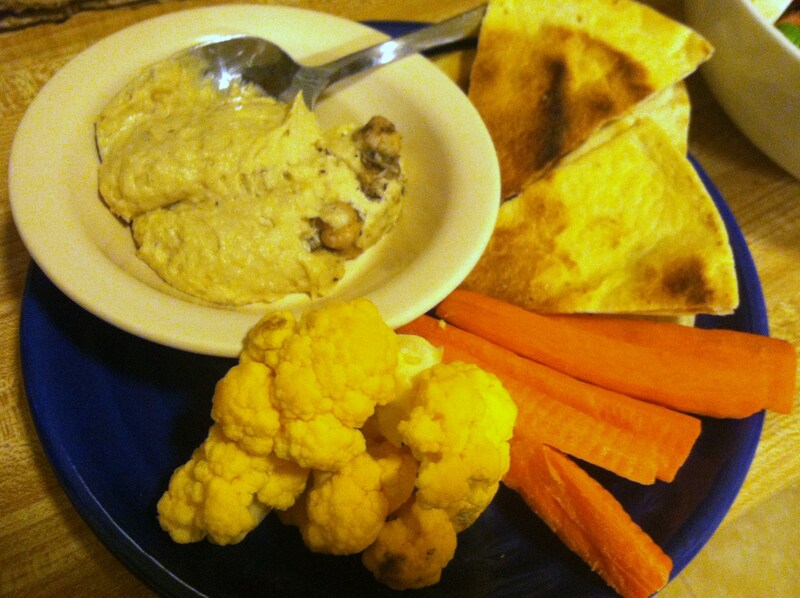 Snack – white bean rosemary hummus with raw veggies. Y’all, if you have not tried this yet you are missing out! 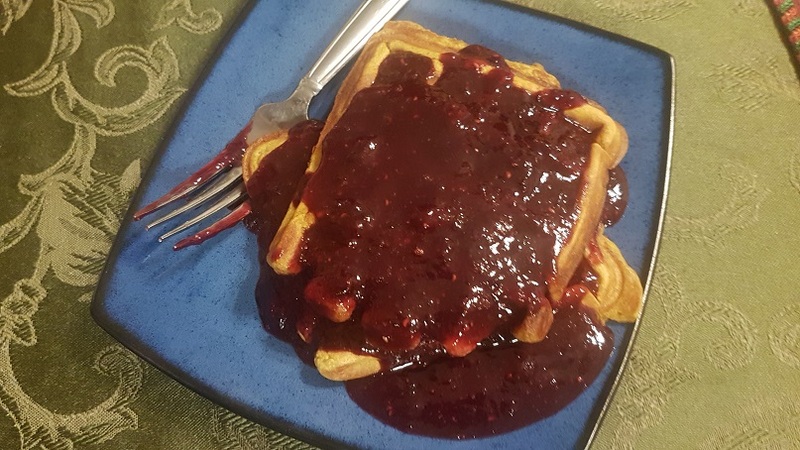 Get out the blender, go read the recipe right now, and make it! 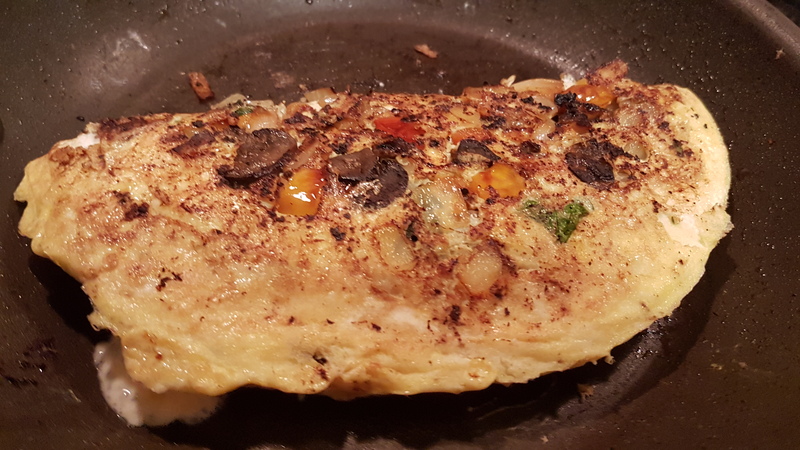 Breakfast – 2 egg veggie omelet. 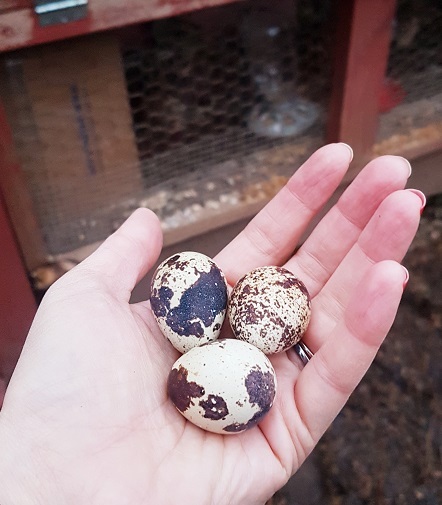 Had some onions, peppers, and mushrooms so I stir fried them and wrapped them in eggs! 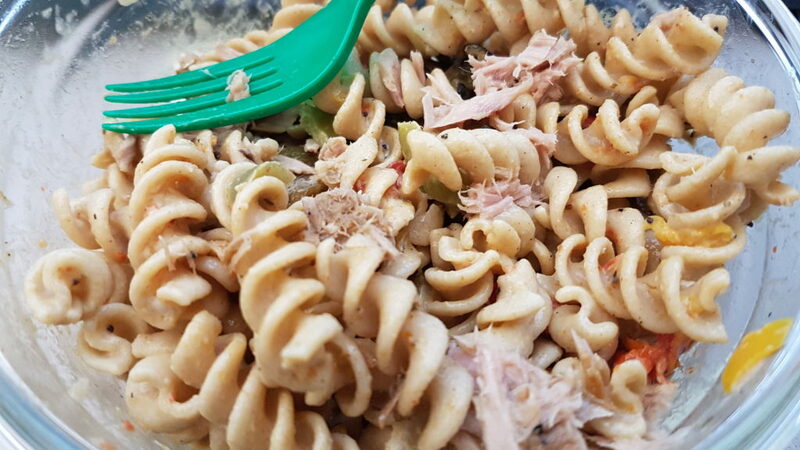 Lunch – tuna noodle casserole. This is giving it a bit more credit than I probably should. 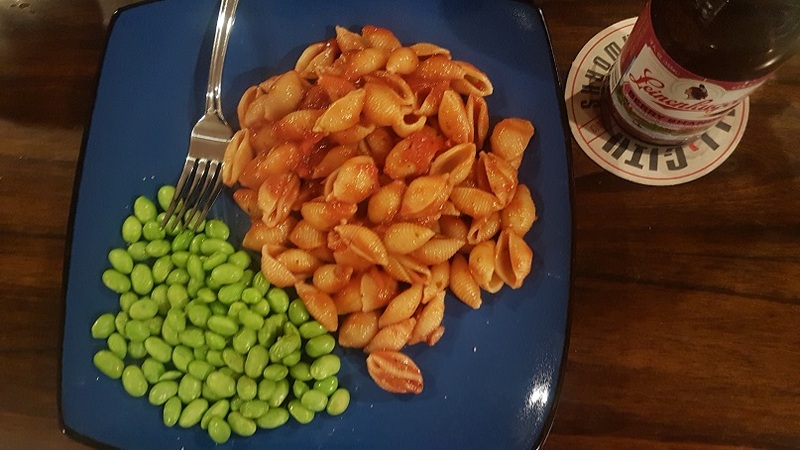 I just took some leftover cooked pasta salad that already had bits of peppers and onion and mayo, and added a can of tuna to it to give it protein. Then I called that lunch! Dinner – baked blue cheese & spinach chicken rolls with oven-roasted potato wedges & garlic aioli. Sounds super fancy, I know, but honestly it is literally 3 ingredients! 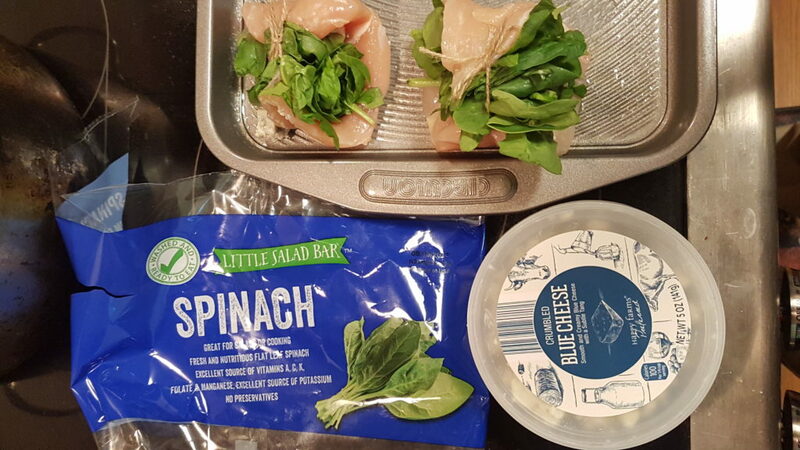 Just thin chicken breasts, a pinch of blue cheese and handful of spinach, roll up and secure with cooking twine or toothpicks and bake! 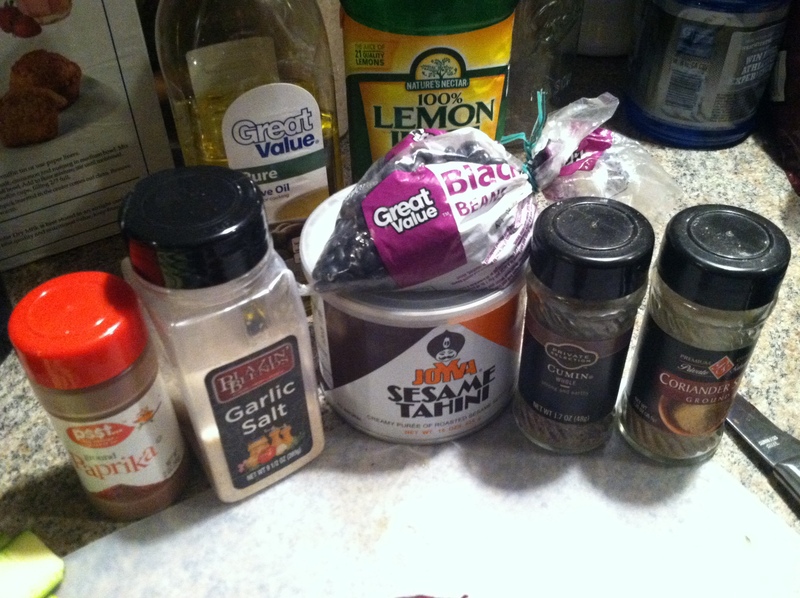 The garlic aioli is 1-2 garlic cloves diced small, 2 tbsp. lemon juice, and 1/2 cup mayonnaise, mixed well. This is an excellent dip for chicken and potato wedges. Feel free to pull out this recipe anytime you need to impress someone but have seriously 5 minutes to focus on making the food. Oh, and I also got a little crafty this week! 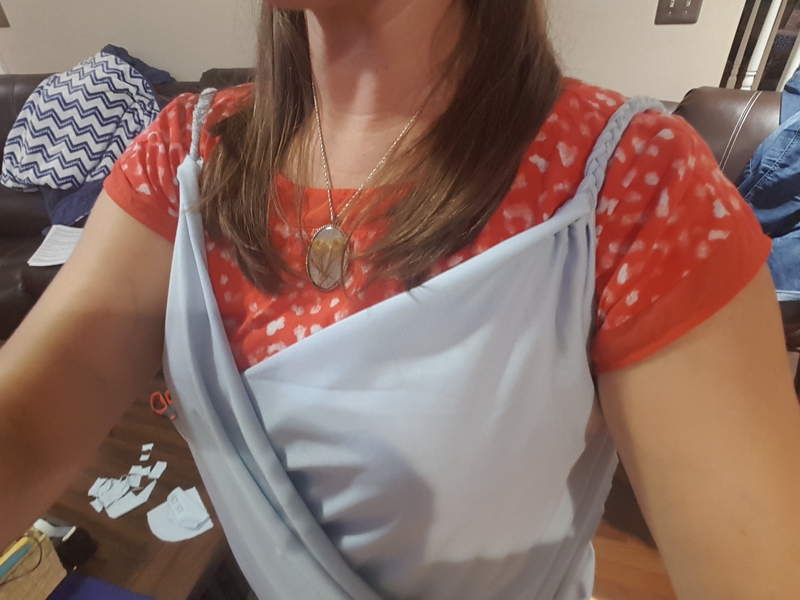 I had seen a YouTube video for a bathing suit wrap that’s almost no-sew, and just had to try it. Of course, I didn’t get to it in time for the beach last weekend, but that’s ok. It really was so easy! Just cut it to the right width to wrap around you, cut arm holes, and braid 3 strips of fabric for the shoulder straps. The straps were the only sewing part, and it took like 10 minutes total! I can’t wait to go somewhere that I can use it! This recipe was so easy to follow, and I LOVE pretzels, so how could it possibly go wrong? 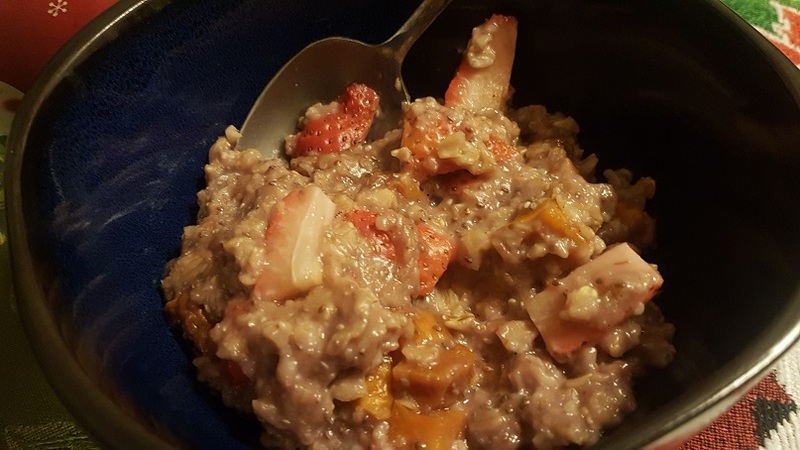 Well, I think using JIF added more oil than it needed, what with the extra coconut oil, so it was pretty greasy… but the flavor was out of this world delish, so this recipe is a keeper! 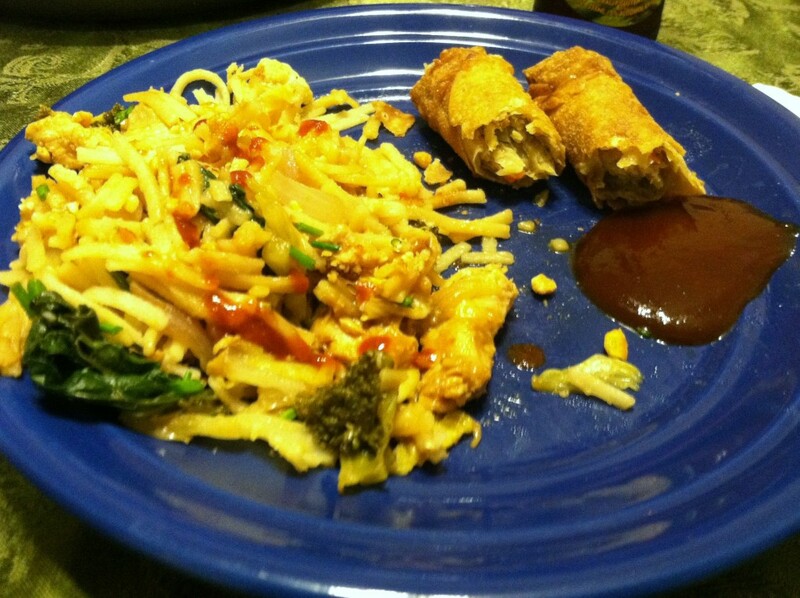 I will definitely tweak it and make these again. 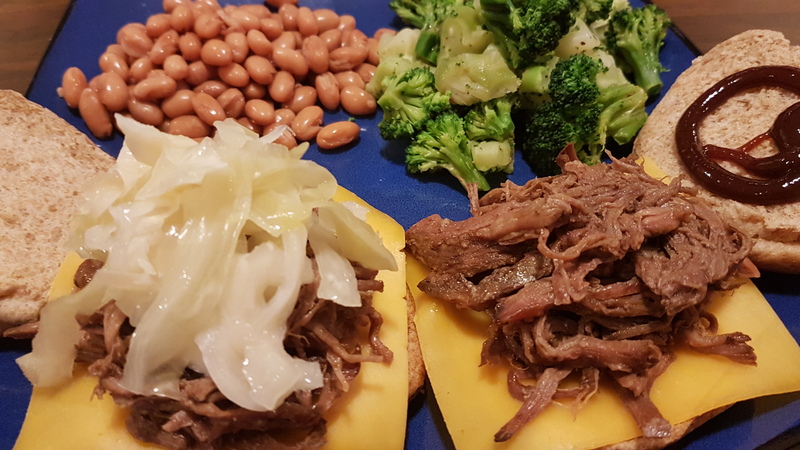 Dinner – slow cooker pulled beef sandwiches with steamed broccoli and pinto beans. I literally just stuck a pound of beef roast in the crock pot before work, came home and shredded it. 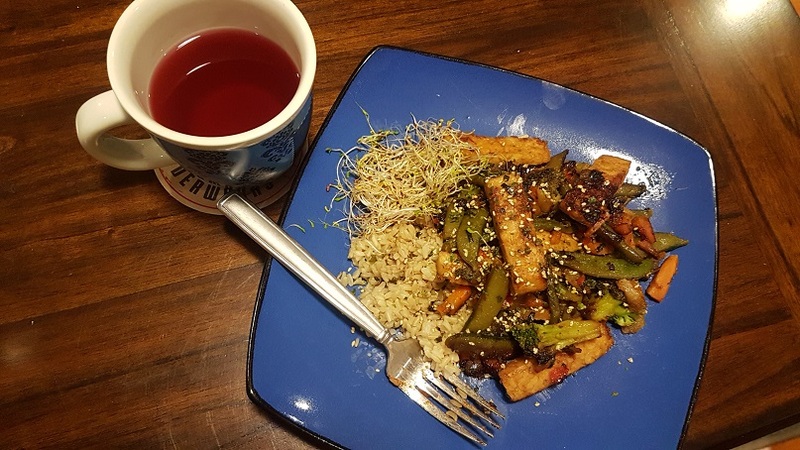 Could not ask for a simpler, but seriously tasty, dinner! 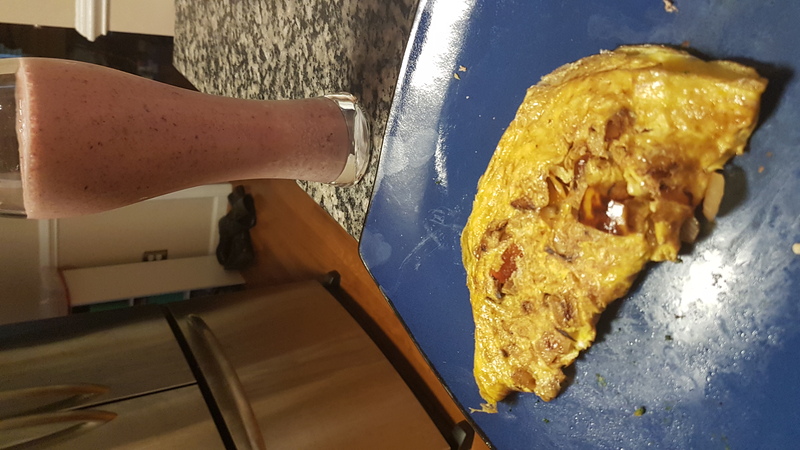 Breakfast – pepper & onion omelet for me, cherry vanilla smoothie for the man. I think we’ve found a new favorite! 1/2 cup frozen cherries, 1/2 cup cherry juice, 1/2 cup yogurt, 1 scoop vanilla protein powder. It is GOOD! 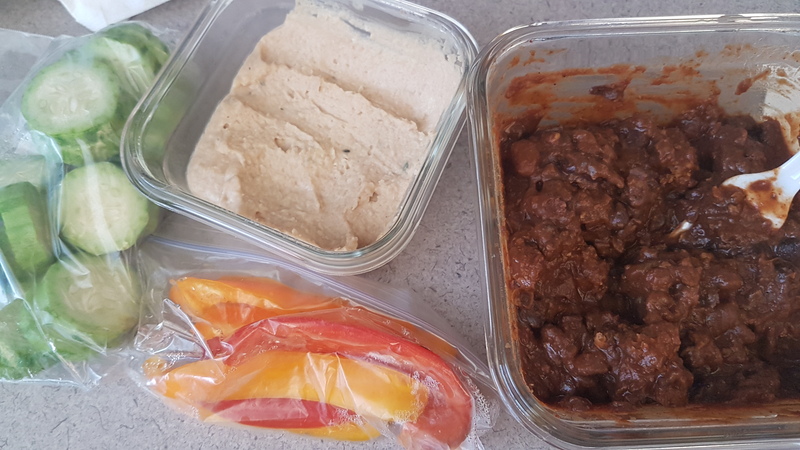 Lunch – the rest of the turkey chili & more white bean hummus! 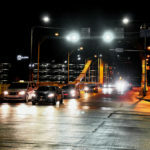 See how making big batches of things early in the week can mean less work the rest of the week? Dinner – turkey burritos! 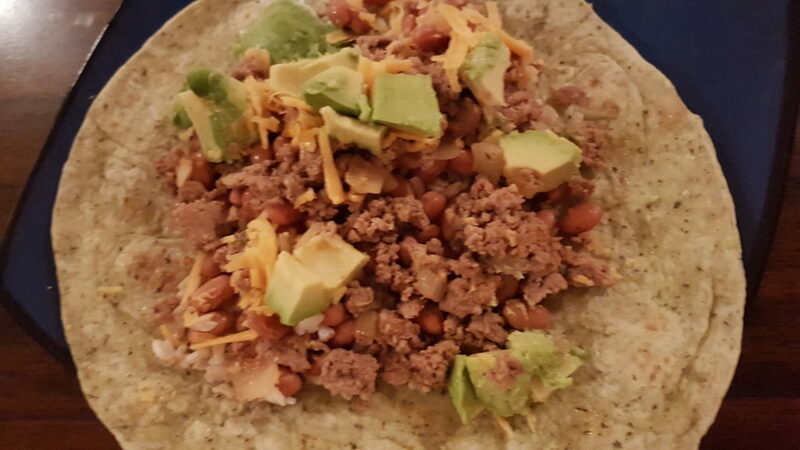 Because burritos are the kings of food. 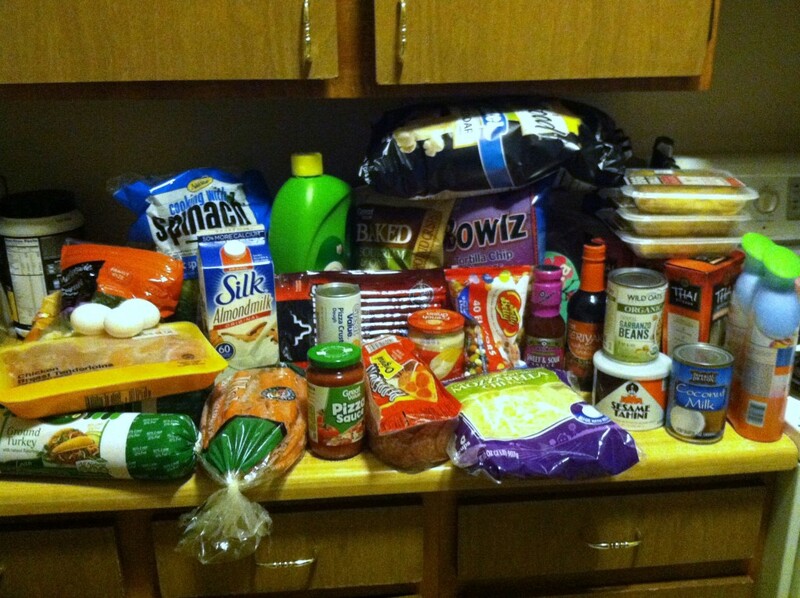 I also had a great batch-prep night because this is when I went grocery shopping for the weekend parties (see below). 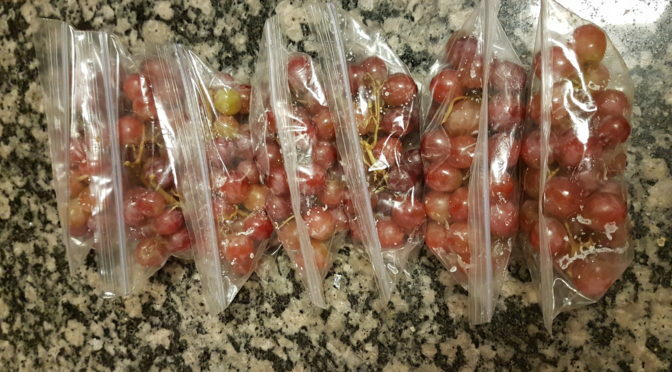 I cooked up like 6 pounds of ground turkey and beef and packed it in 1lb zip locks to freeze, got a great deal on marked-down overripe bananas that I froze to make smoothies and bread in the future, and washed and cut up and bagged grapes, cherries, and strawberries for snacks. 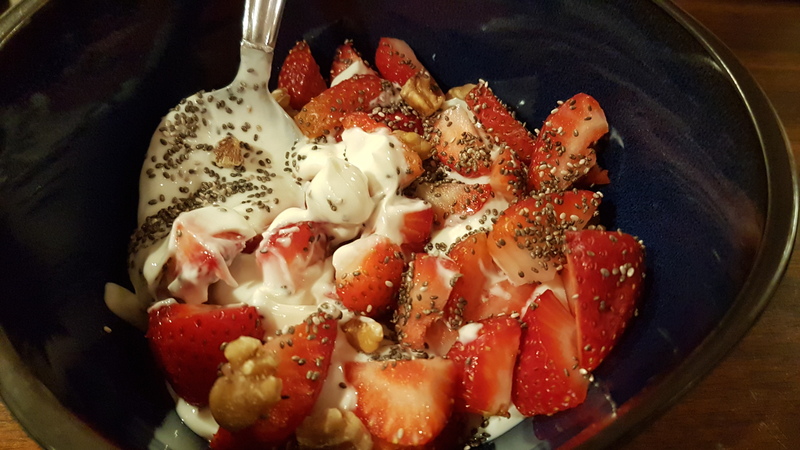 Breakfast – vanilla Greek yogurt with strawberries, chia seeds, & walnuts. I made a grave error at the store, and grabbed flavored Greek rather than plain. 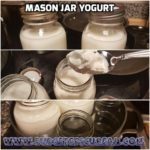 I do make my own yogurt, but haven’t mastered the making it thicker like Greek yogurt part. So I got some for the hubs to put on burritos… oops. Well, now we will have smoothies and yogurt for breakfasts. 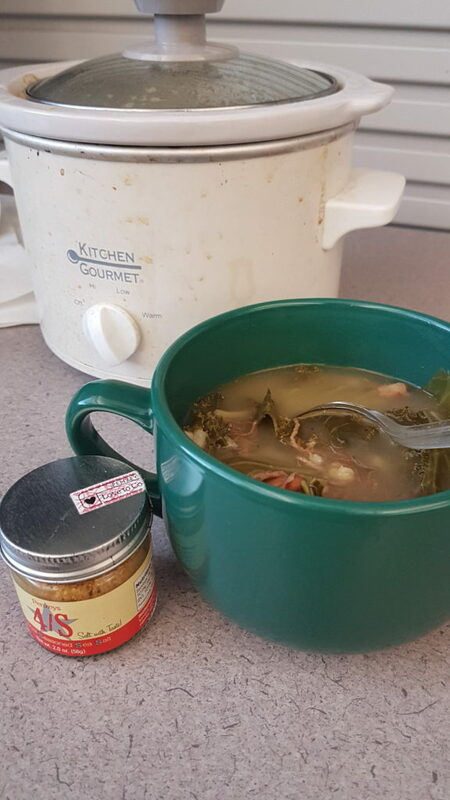 Lunch – Beef & veggie leftover soup. 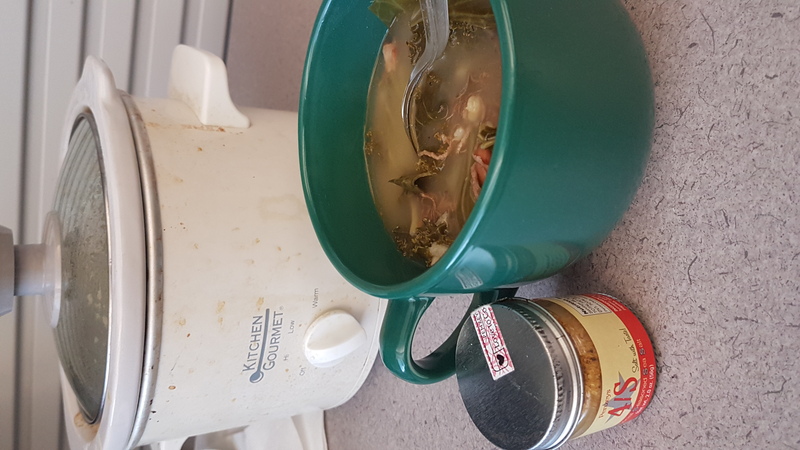 I took my small crock pot to work, and used up the little bit of leftover pulled beef, beans, broccoli, and some kale. 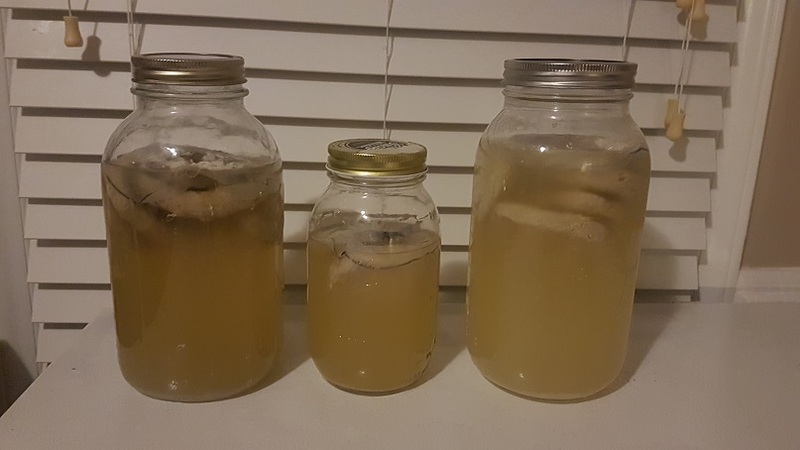 I added a bit of barley, and let it go on my desk all morning. 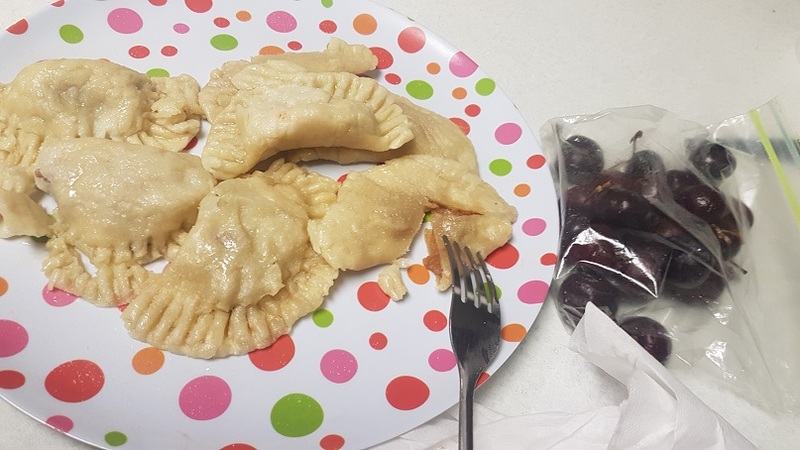 The office smelled great, and I had a cheap hot lunch! 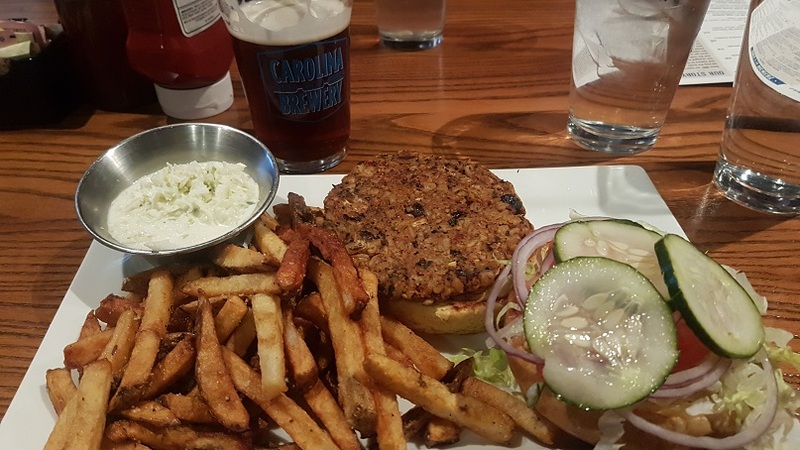 Hence the side salad, for at least a little greenery in our diet. And then Sunday we are hosting a wine tasting by Unique Pairings! I’m super pumped because it means an excuse to eat all the cheese and sweets and try lots of wines! This also helped to inflate the food budget a little, but totally worth. I adore hosting parties. Uh, yeah, so we overshot by $100. BUT. As noted above, we are going to 2 different parties this weekend, and most of the extra food was for appetizers/foods to share. Also, as hosts, we will frequently wind up with tons of leftover food, which will likely feature in a lot of next week’s meals. Plus, SEVENTY NINE CENTS A POUND for chicken!! Come on. Tell me you wouldn’t buy like ten if you had the freezer space for that. A lot of this was stocking up on good sales, so that in future weeks we won’t have to spend as much on meats/etc. 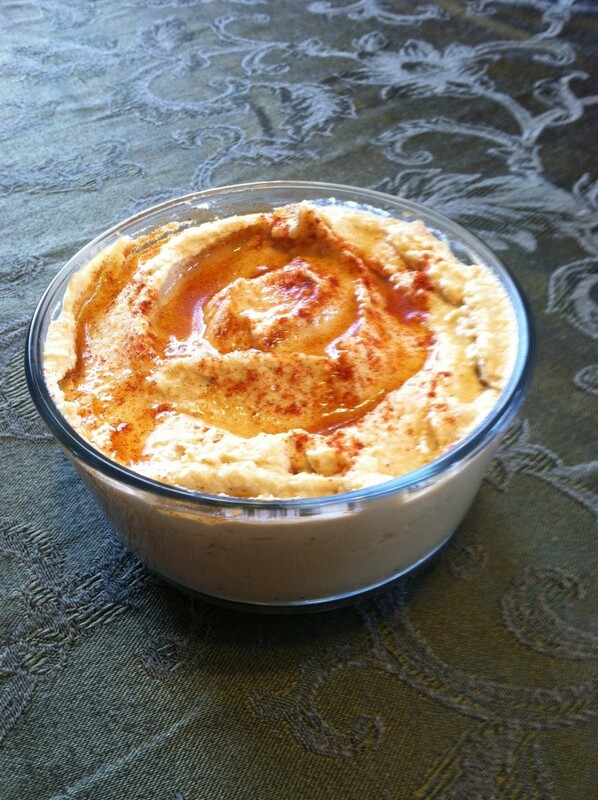 Hummus is a wonderful thing. 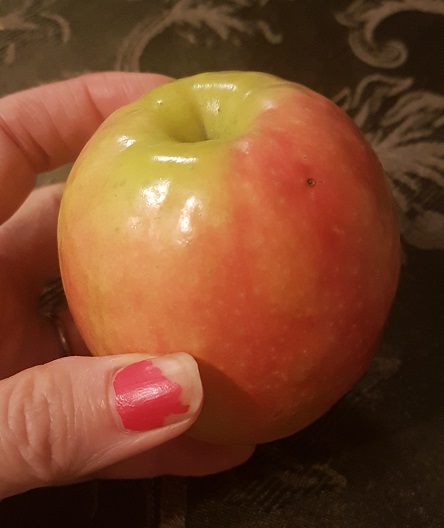 It is delicious and versatile, you can add it to sandwiches and wraps, stir some into soups to thicken it and add flavor, or eat it alone or with chips or crudites. 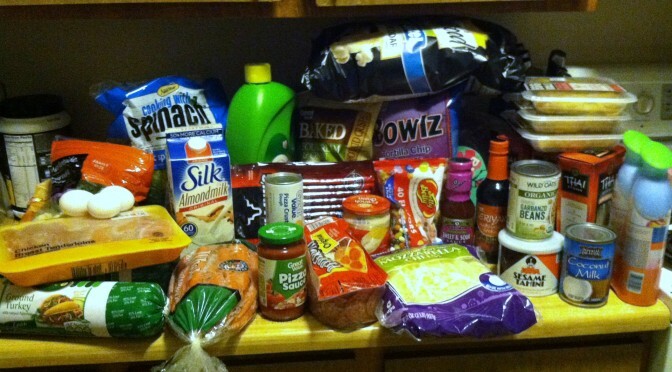 But hummus is so expensive at the store! you say. I know, I don’t love paying $3 for 8oz either. 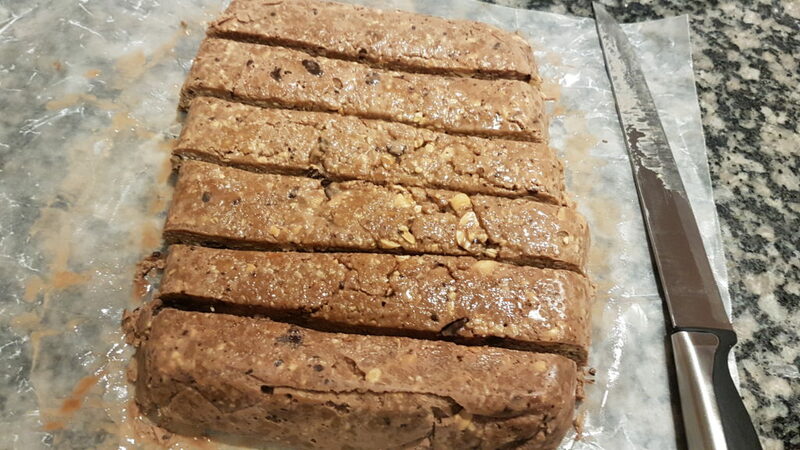 Ever tried making your own? 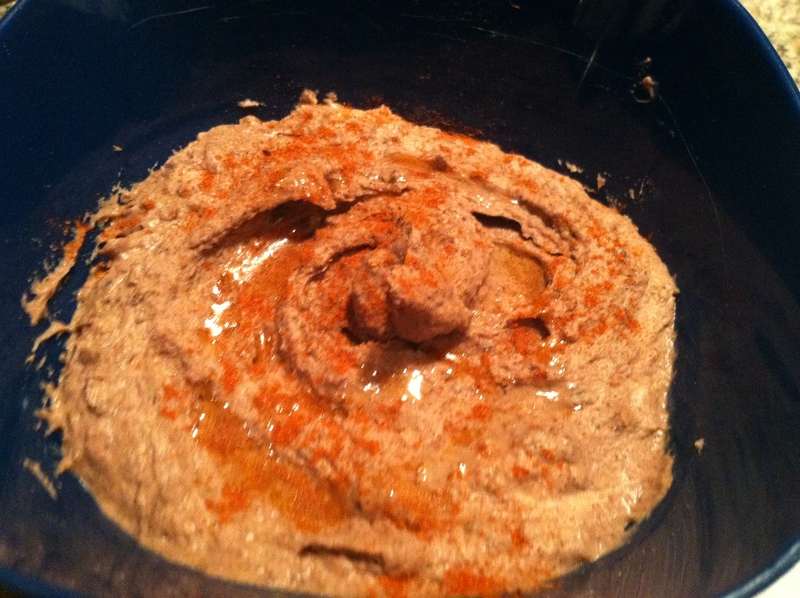 One of the reasons hummus can get so expensive is the tahini paste. 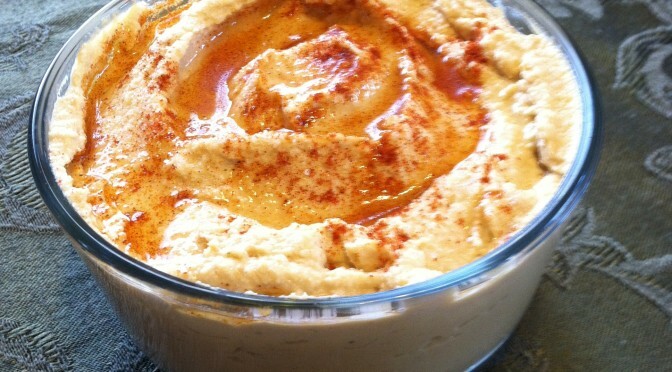 Marketed as a key ingredient, it helps give hummus that earthy umami flavor and smooth texture. But what if I told you instead of a $10 ingredient, you could use a $1 ingredient, and it would taste essentially the same? Think about it. 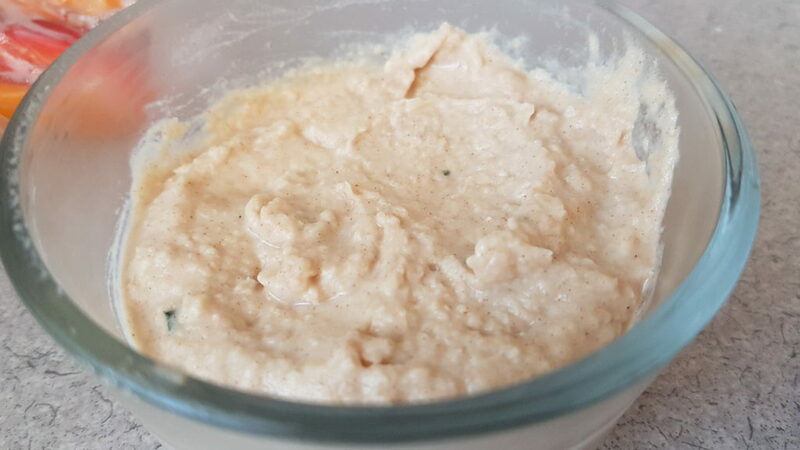 What is tahini paste? 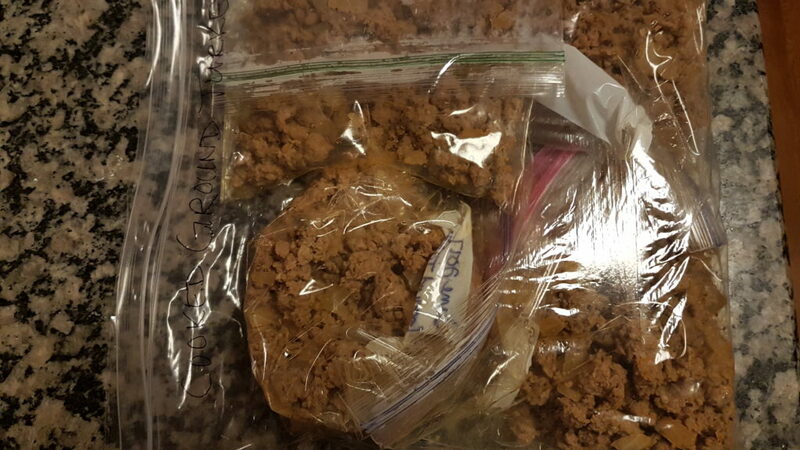 It’s ground sesame seed. 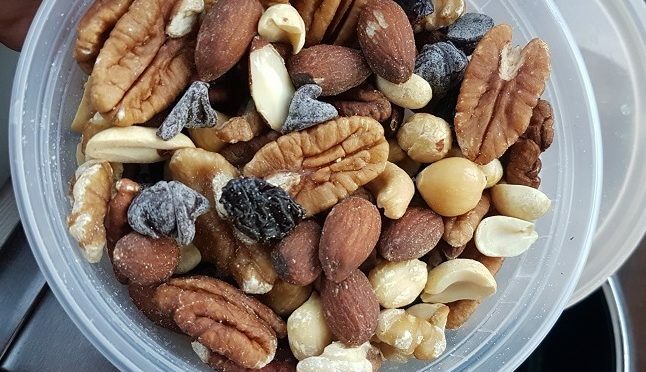 Which is kind of like a nut butter. And guess what tastes similar? Other actual nut butters! 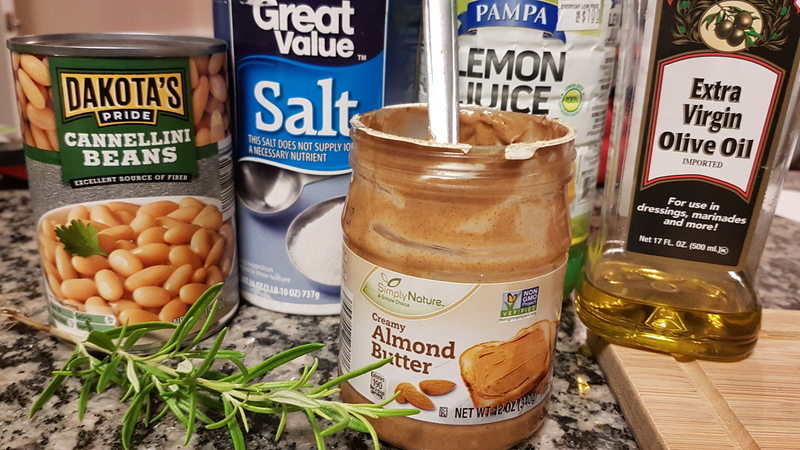 I’ve used peanut butter and almond butter before, I think Almond Butter is my favorite! 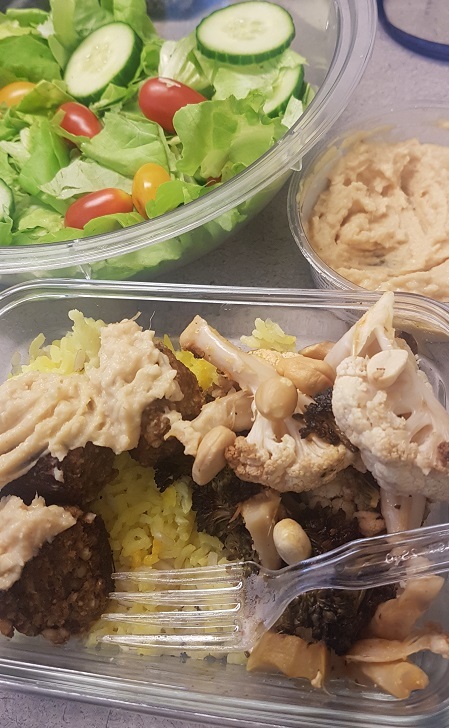 Oh, and what if you don’t like chickpeas? Or think those are too over-priced as well? Good news! 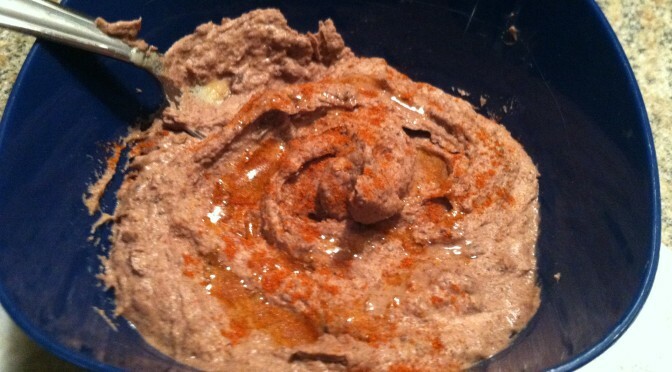 You can make black bean hummus just as easily, or try this amazing white bean recipe below. Each creates a slightly different flavor and texture, try them all and make a big dip buffet! 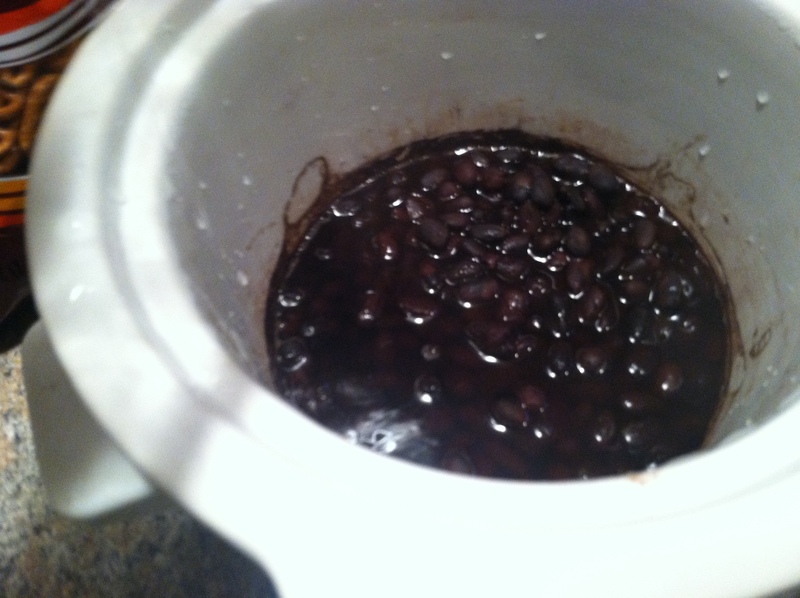 Step 1: Drain beans, add to blender. Add in the garlic, lemon, oil, almond butter, and rosemary. Blend well for about 1 minute, until it is a thick paste. Add some more oil or a dash of warm water if you’d like it thinner. 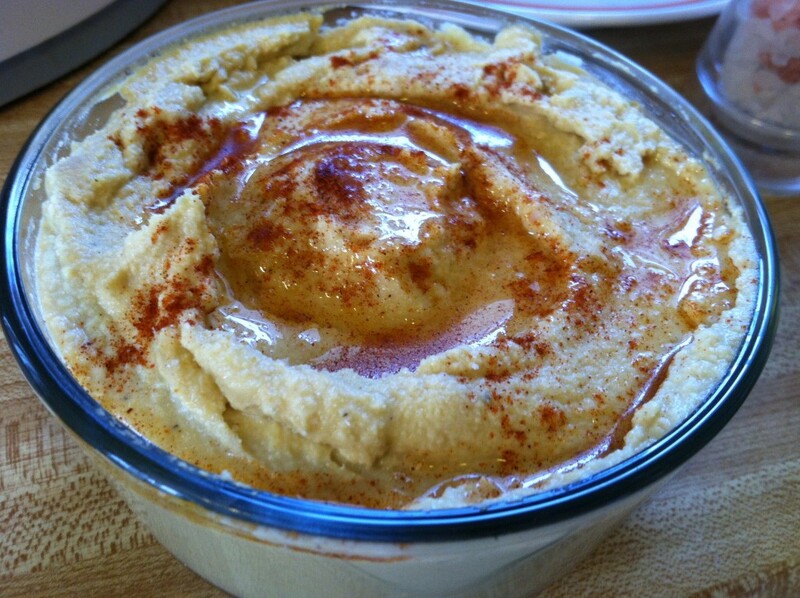 This recipe makes about 2 cups prepared hummus. 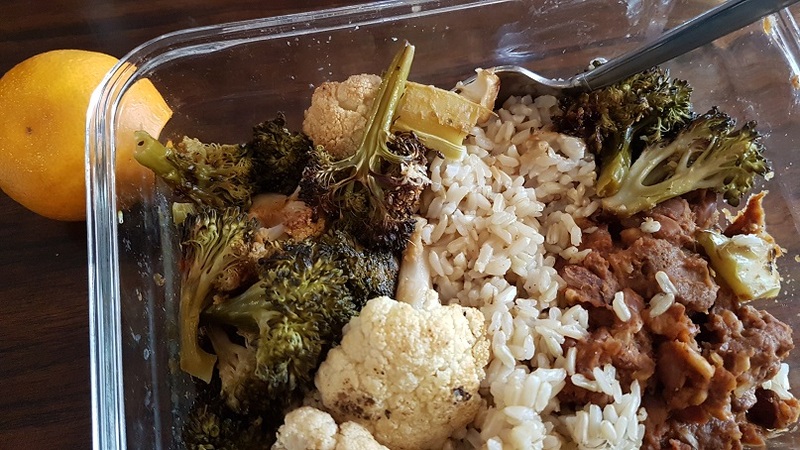 I pack it into small containers and take it to work with diced up fresh veggies as my afternoon snack most days! 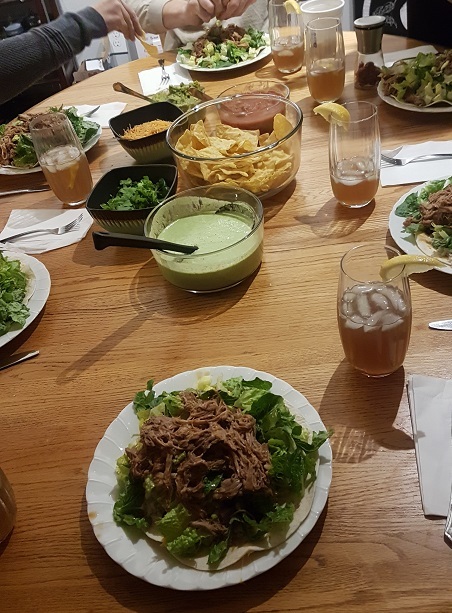 It is also great for parties and potlucks. Disclaimer: This blog is a part of the Amazon Affiliate program. Some links will take you to an Amazon page to buy those items. 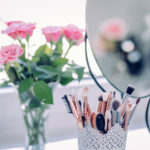 This does not impact the price you pay, but the blog gets a teeny tiny commission that over time helps pay the bills. Thanks in advance if you participate! 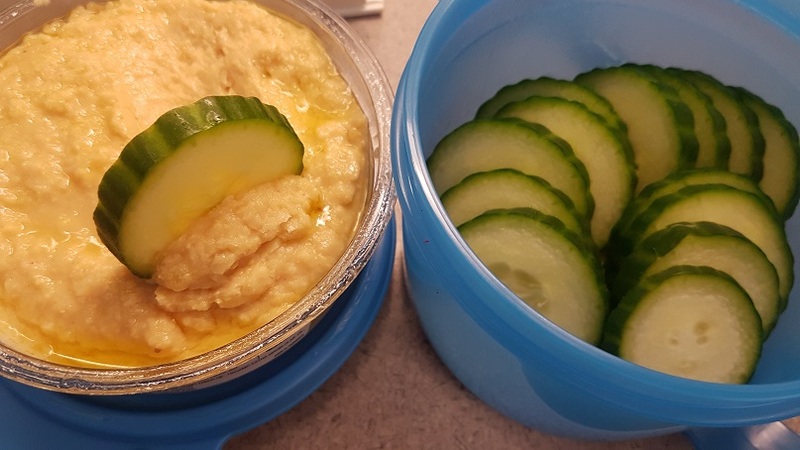 If you haven’t jumped on the hummus bandwagon yet, you should definitely consider it! Hummus is super heart-healthy, especially when made at home. And it is so very easy! 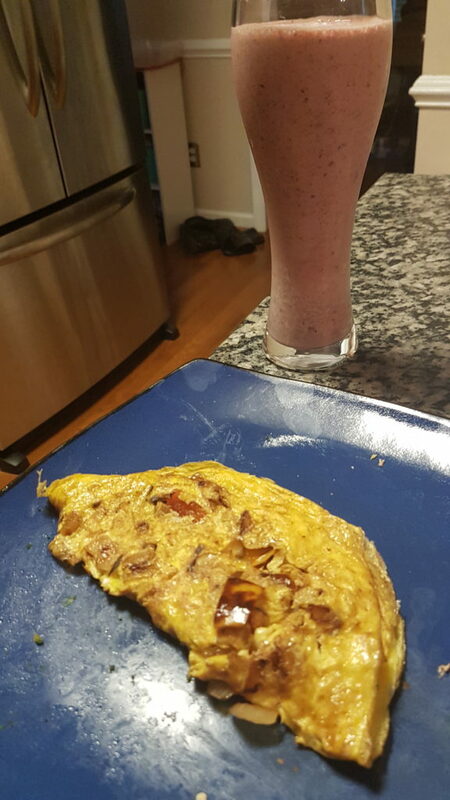 Just put all the ingredients into a blender and whir for a minute or two, and presto! 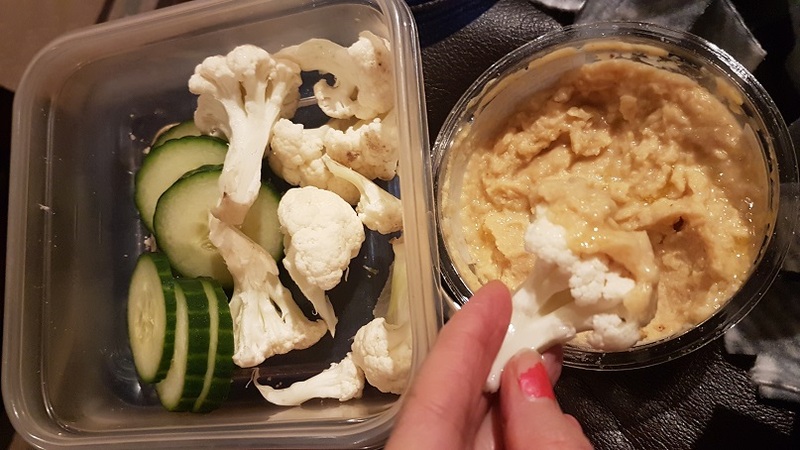 A tasty, healthy, fiber-full dip or snack. 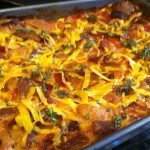 This recipe is a basic recipe, great for pre-dinner appetizers, a party snack, or really anytime. 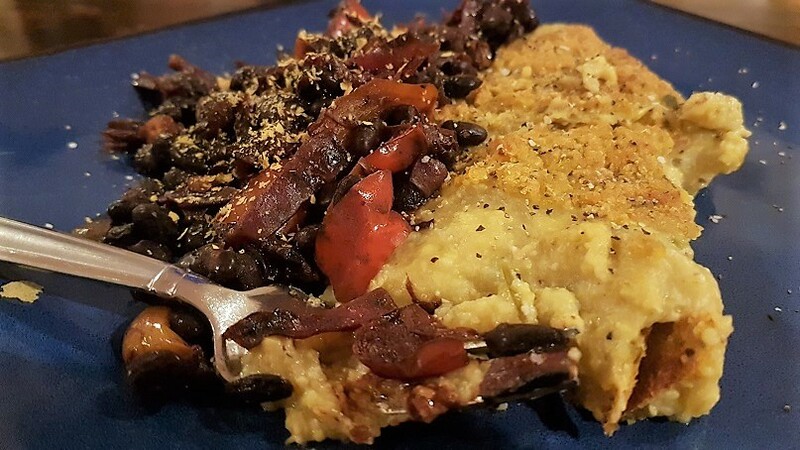 You can get creative with roasted peppers, beets, green veggies, or really anything you set your mind to. 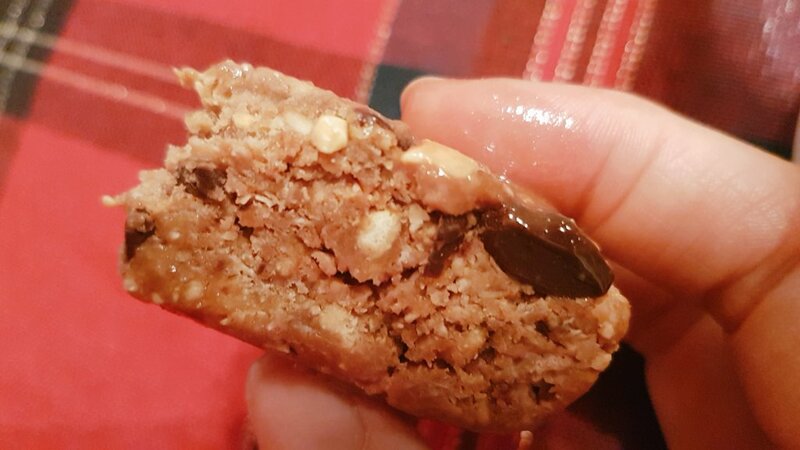 Feel free to experiment with different nut butters if you don’t want to buy tahini. 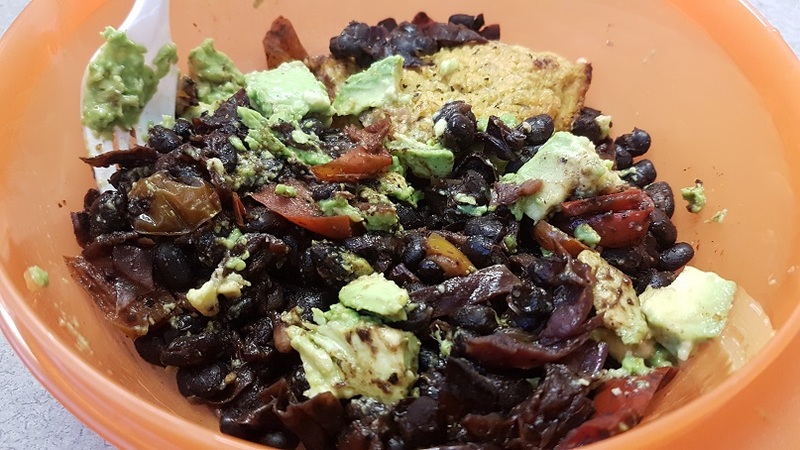 I’ve also made black bean hummus before, so you don’t even have to use chickpeas. Step 1: Place all ingredients into a blender. Blend on high until well mixed. Taste, and add more of this or that until it’s perfect. 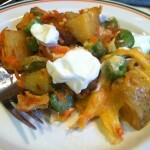 It’s best to serve with fresh cut veggies, or toast your own pita chips. 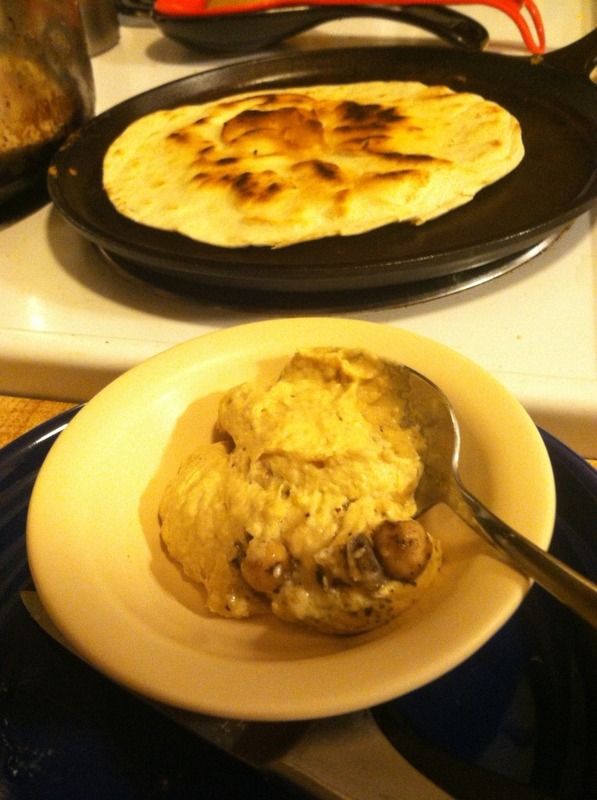 To make pita chips, spray a cookie sheet with oil, and place 2-4 tortillas on it. Bake at 350 for 8-10 minutes, until crispy but not burnt. Cut into wedges. Enjoy! 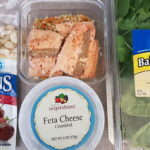 This is part two of my experience with the Walmart Grocery To Go service. This second order was in anticipation of a birthday party. My boyfriend got lucky, our birthdays are exactly one day apart. No excuse for forgetting my birthday, ever. So we were both at home in our respective states for the holidays, meaning we did not get to celebrate our birthdays together. We decided when we got back we would throw a joint party for all our friends to come hang out and tell stories of their holidays too. This would be the first time we all saw each other in about a month. I had placed the order a few days ahead of time, and set the delivery for between 6-8PM on Thursday. We had dinner, watched a movie. It was 6:30… 7:30… 8… 8:30… 9. I called the customer service line to figure out what was going on. The representative was refreshingly helpful and kind, he really was awesome. If only all customer service was like this. However, what he found out was that the location I had ordered from was running four hours behind, and no one could contact the driver of the delivery truck, though my order was apparently already loaded onto the truck. My order might not be delivered until after 1am… do I still want it? Ummm… no! I’m not staying up way past midnight when I have to wake up the next day at 5:30AM for work. So I thought he cancelled it, yet I still got a call from someone around 11, who left me a voicemail telling me the same thing, my order will be delivered around 1am, do I still want it? However, there were no delivery times available the next day, which was the planned day of the party. I could go pick up the order at the store after noon, did I want to do that? 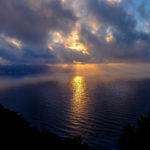 The whole point of delivery, is that it is delivered. I don’t have to drive a half hour and go into the store to pick it up then load it into my car, drive home, and unload it all. However, three of the people we invited had other things happening that weekend anyways, so we moved the party date to the following weekend. Good news for Walmart I guess. So I rescheduled the delivery. And as a bonus for having messed up, they increased my budget a little and gave me free delivery again. Something is better than nothing I suppose. Now the delivery was set for the following Thursday night, same time, 6-8PM. Thankfully, this one showed up on time, right around 6:45. I had decided to go with an Asian theme for dinner. 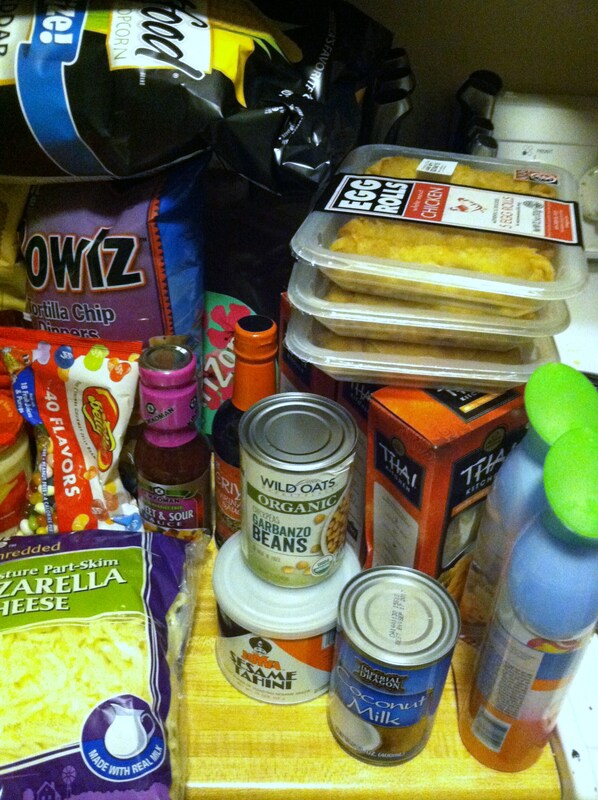 I stocked up on some stir-fry noodles, teriyaki sauce, fresh veggies and chicken, sweet & sour sauce, and egg rolls. I already have some chop sticks I bought forever ago, so I busted those out too. There was one item out of stock (the bok choi for stir fry) and a substitution of Lays brand dip for the Walmart Great Value brand. That wasn’t a problem, because the substituted brand was actually more expensive, but they do not charge you the difference. Then for the “party” portion after dinner, I got several types of chips and French onion dip. 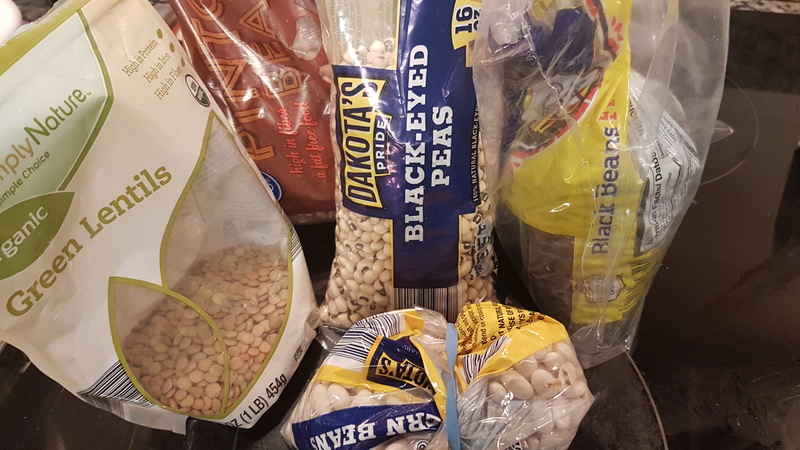 A few cans of chickpeas and a can of tahini so that I can make my own hummus. Several party size bags of white cheddar popcorn (pretty sure the “white” part is crack. Cause for real, I can eat an entire bag in a day), and jelly beans. In terms of the rest of the party experience, I also decided to get some “Island Fresh” Febreze so my house smells pretty, as well as Suave clinical strength deodorant, so I smell pretty too! And bonus for those readers over 21, beer is an option on Walmart Grocery. Count me in for a 24-pack of the 16 oz cans of Budweiser. 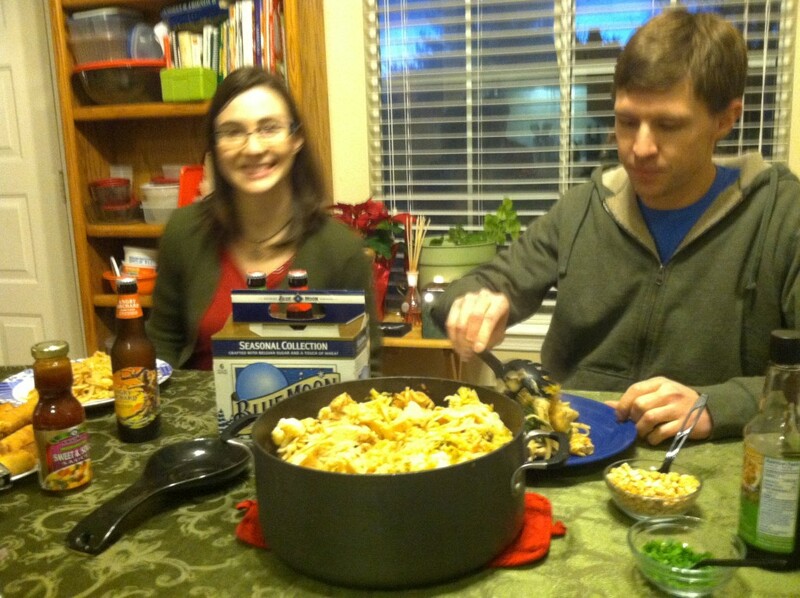 For after the party, I got a gigantic bottle of lemon scented Cascade, to make dish clean-up easy breezy. Step 1: Bring a pot of water to a boil, and boil your noodles 7-9 minutes. In a large frying pan or wok, heat the coconut oil. Add the peppers, broccoli, and/or cauliflower and cook 5-6 minutes, covered. Then add the spinach, cabbage, and any spices/hot sauce. Cook another few minutes, until all veggies are soft. 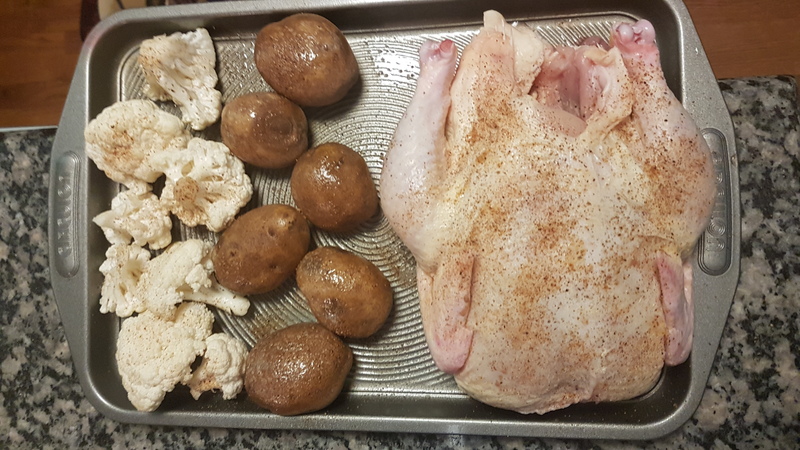 Step 2: Either in a separate pan, or remove the veggies and keep warm, cook the chicken strips 8-10 minutes both sides, until no longer pink in the center. Pour on the terikayi sauce, heat to simmering. Add the cornstarch and whisk to combine. Cook until sauce thickens. 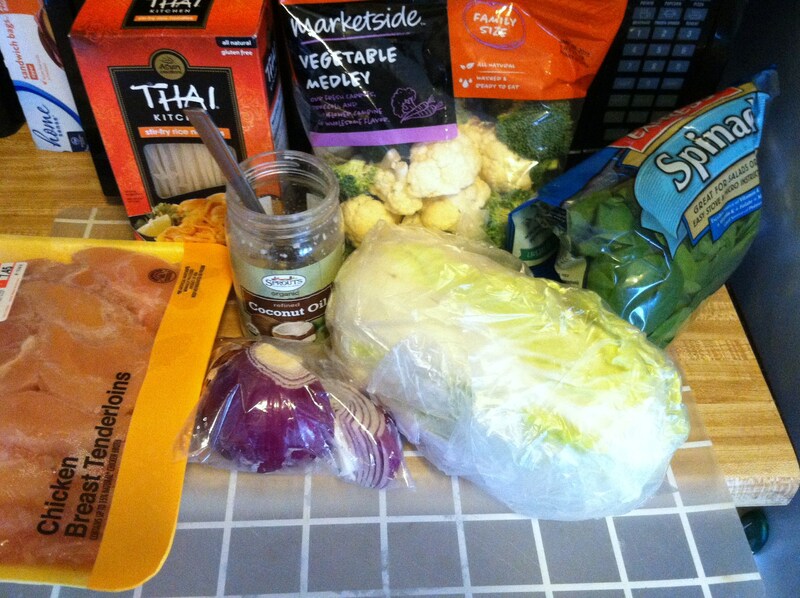 Combine with veggies. Step 3: Strain the noodles, and add to the pan. Mix everything well, and heat through. We had a lovely dinner together, sharing stories and catching up. 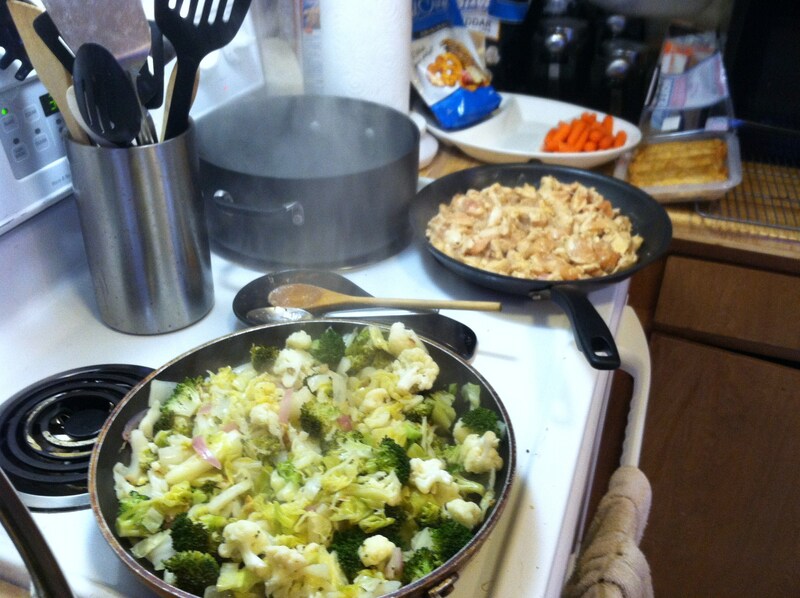 The stir fry was a hit! The teriyaki sauce is delicious but thinner than I thought. I added some cornstarch to thicken it up and it worked like a charm. 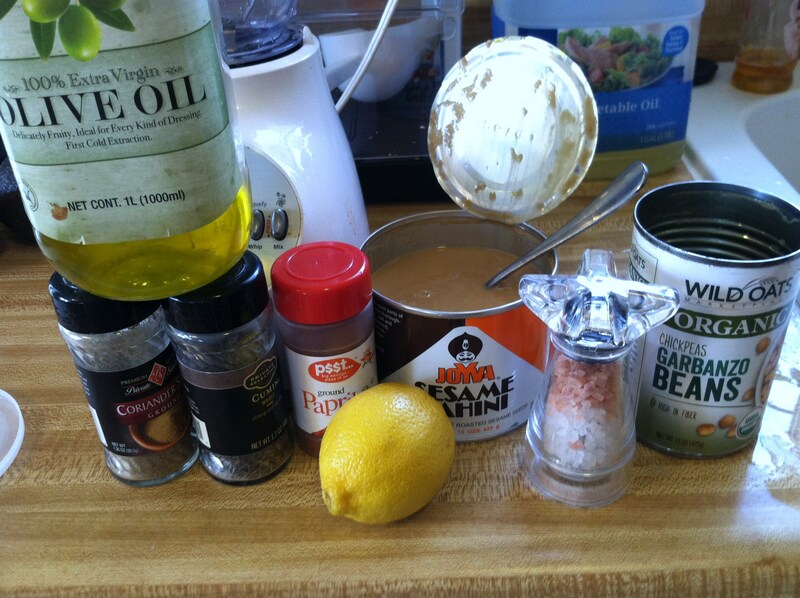 Step 1: Add the tahini and lemon juice to a food processor or blender, and blend on high for at least 1 minute, up to 10. 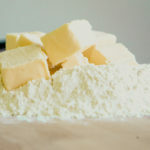 According to this recipe from Inspired Taste, this makes all the difference in a smooth, store-bought-like consistency. 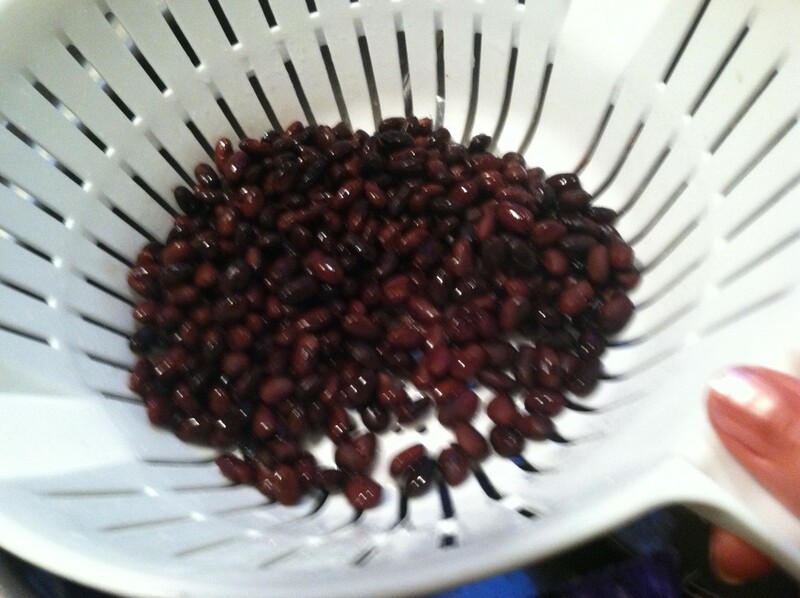 Step 2: Open the can of garbanzos, and put in a colander. Run cold water over them for several minutes to remove any toxins & excess sodium. 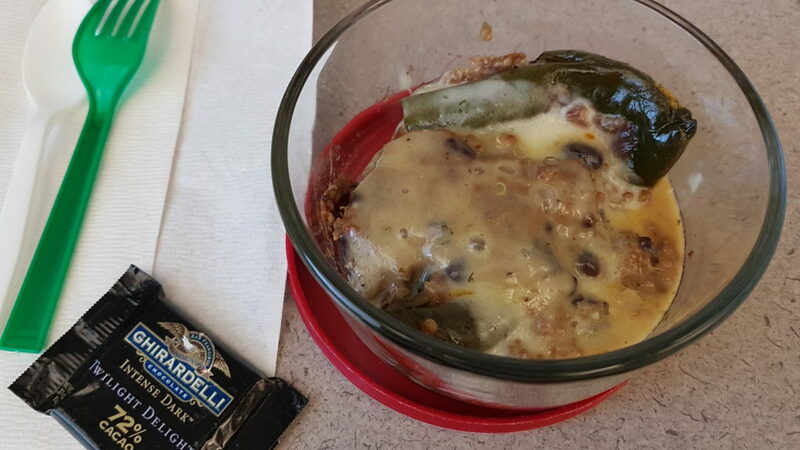 If you wish, add to a microwave-safe bowl and microwave for 2-3 minutes to soften them. 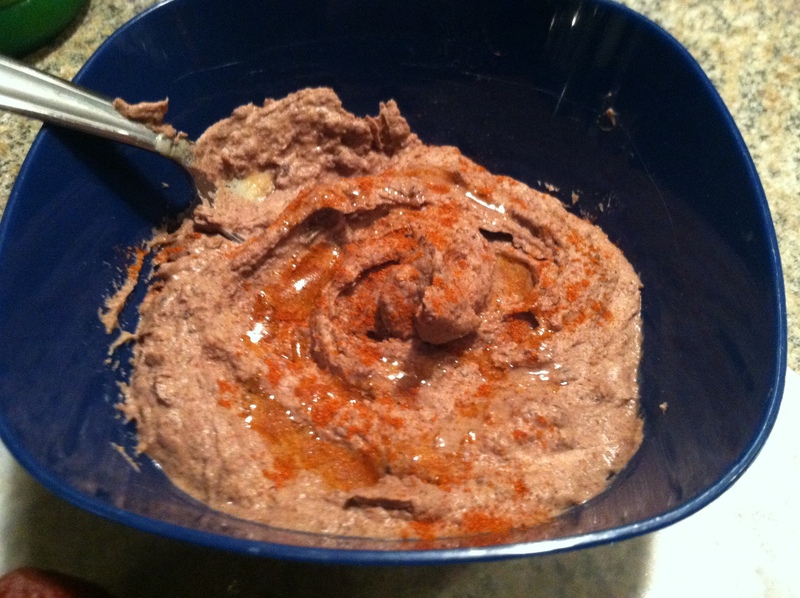 Then add to the tahini paste and blend another 4-5 minutes. Step 3: Add the garlic cloves, olive oil, and sea salt to taste, along with any other desired ingredients. 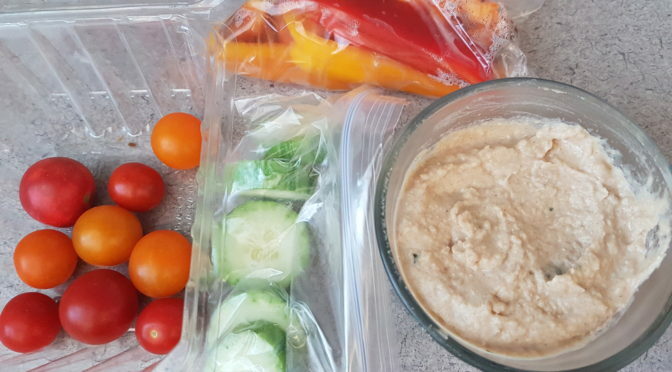 If you don’t have tahini, try peanut butter or almond butter. You can use whatever spices sound good to you. Roast some beets and add them for a shocking pink hummus or a cup of cooked edamame for a delicate green boost of protein and fiber. Get crazy! 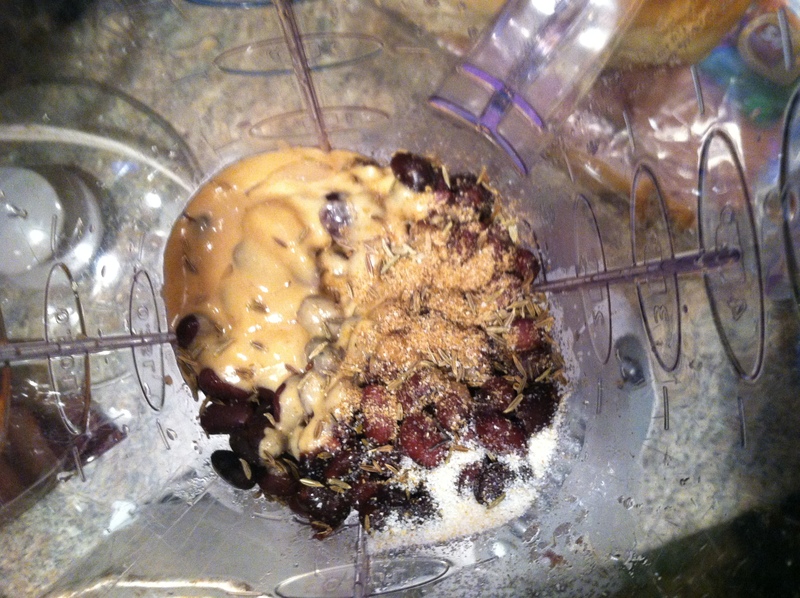 Step 4: Blend everything well until the desired consistency, adding a few tbsp water if needed. Use a spatula to pour into a bowl, and garnish with some olive oil, a dash of paprika, and/or some fresh herbs. Enjoy alone, on sandwiches, or with fresh crudités. 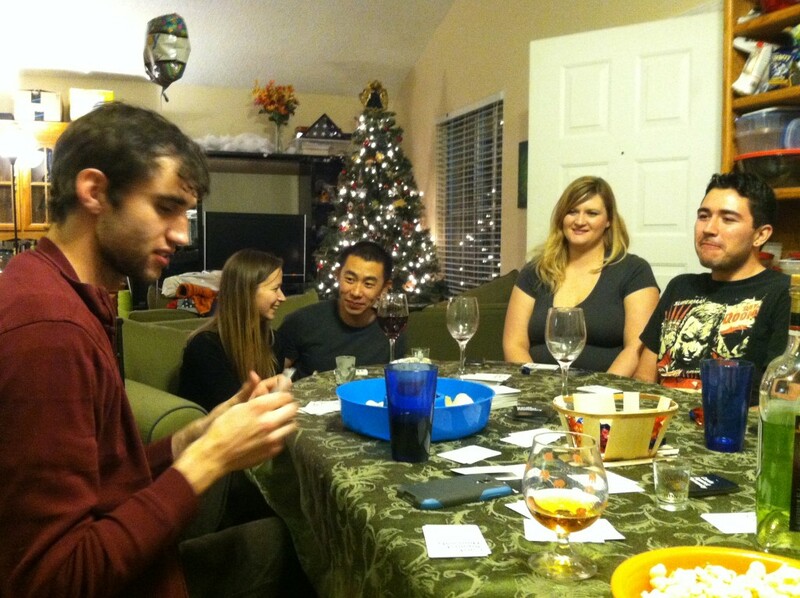 Several games were gifted to us during the holidays, one of which is always a huge hit at parties: Cards Against Humanity. 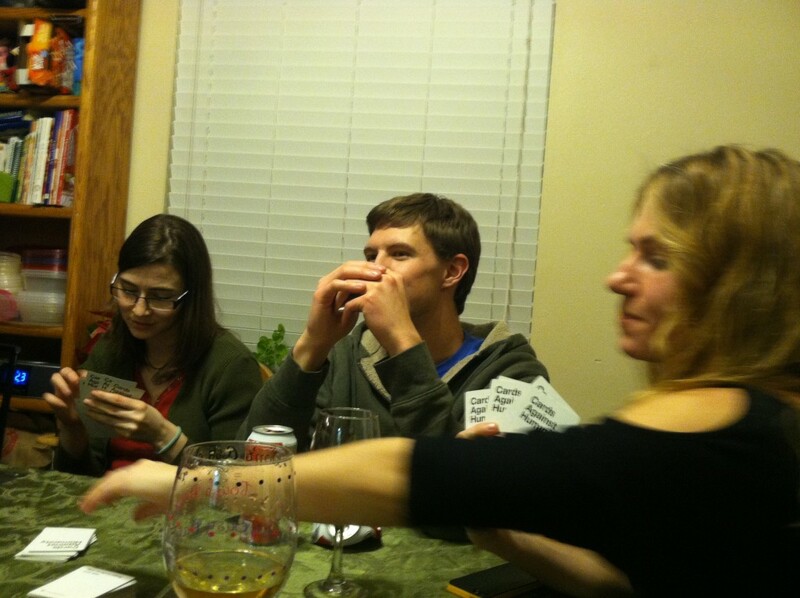 With game-play much like Apples to Apples but with a much more… “mature” card content, our group of friends loved it. If your friends (and you) like intricate games with a lot of thought and strategy, you might want to look into Betrayal at House on the Hill. In this game, you are a band of brave explorers who find a haunted house. 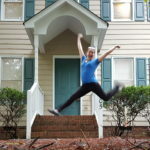 You go through the house discovering new rooms. Based on the rooms you find, different events can happen. At some point during the game, “the Haunting” is triggered. The game decides who becomes the Traitor, who must now try to accomplish their goal to the detriment of their former friends, whilst the Heroes now try to defeat them first. With 50 different unique stories, and endless unpredictable variations, this game will keep us entertained for a long time to come! One whole bag of the white cheddar popcorn disappeared within the first two hours, and the homemade hummus was way better than even the freshest deli purchased tub. No one commented on the Island scent, but no one said it smelled bad either, so that’s a win. And the lemon Cascade works great for clean dishes with no streaks, and just a hint of lemon scent. All in all, this delivery was far more trouble and frustration, though it worked out in the end. If I had this planned for an event that actually happened the day it was planned and my delivery just didn’t show up until after midnight, I would be extremely displeased. They did try to make it right after the fact, but we are at 50% (one of two deliveries were positive experiences). One more delivery remains, so stay tuned!